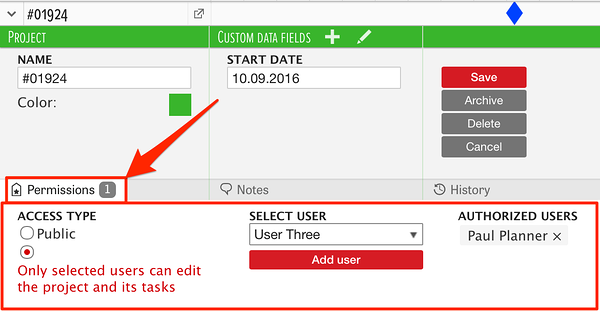 When you create a project you can choose which users are able to edit its details and tasks. That's a useful feature for those of you that are planning resources for a project portfolio, and you have multiple managers that do the planning. It can happen that resources get allocated to another project without consent. Special permissions help to avoid that. Administrators can still view and edit all the projects and tasks regardless of the special permissions. If you don't add any special permissions, all the user rights that have been set before still apply. It's possible in the project list, single project view or when resources are grouped by projects. You'll find it below the project title. This will enable you to select users that can edit the project. User rights and project rights work hand in hand. If you give access to your project for a certain user but they don't have access to the resources attached to the project, they are still limited by their resource rights. Click on 'Add user' once you have found the user you want to be able to edit your project. You can select multiple users to give editing rights to. Now, only the users you have selected can edit the project and its tasks. The project rights you have selected apply to all of the tasks that are connected to that project, too. A padlock in front of the task title symbolizes that. So even if a user has rights to add and edit projects in general and has access to all of the resources, but you don't give them rights to your project, they won't be able to change any of the tasks you have created for the said project. Did not find the answer to your question regarding special project permissions?